How will we shop in the future? Will e-commerce continue to grow, or will we see other trends emerging strongly? In this blog we’ll take a closer look at what we believe the store of the future will look like. There has long been a trend of building bigger stores, with a broad product range and all products gathered in one place. This has been at the expense of the close, personal service that smaller stores have more opportunity to offer. There has been a shift here in consumer behaviour, and more and more people are once more starting to demand quality and service – something that is more difficult to maintain on a large scale. We therefore believe in an upturn for stores that specialise in service and can provide a level of specialist competence and consistent quality that is difficult to find in a large discount store. Delivery to your local post office or to your home at inconvenient times. Handling of goods ordered online is inconvenient, expensive and inefficient – for both supplier and customer. Stores of the future resolve this by means of a smarter collection system, known as Click & Collect. This means that customers can collect their goods from collection points that are not limited by opening hours or handling by staff. The product is instead stored in a collection locker that can take both dry goods and chilled items, and the accessibility of which outperforms traditional parcel handling. Self-scanning technology has been around for a long time, although it has not taken the retail sector by storm as might have been expected. The machines are still inconvenient and nowadays often require so many staff resources that the investment is not profitable for stores. At the same time, self-scanning is an important part of the store of the future – but supplemented by staffed checkouts. We also see a development here in the technology, with a focus on buying tried and tested systems that are optimised for the retail sector and where staff are trained to manage the systems correctly. So, what do you want your store to look like in the future? 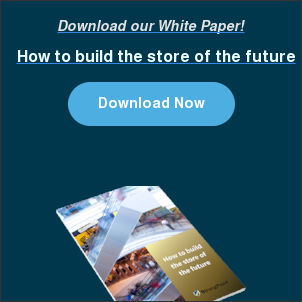 Find out more in our blog post “Why you must invest in the store of the future”.